Sure, I’ve been looking forward to The Avengers ever since Iron Man, which suggested this eventuality. There was much invested (~$250M), much advertising, and high expectations. It’s now been delivered to audiences, and Writer/Director Joss Whedon (Buffy the Vampire Slayer) deserves a lot of credit. The pace is terrific. With so many characters to contend with, it’s hard to spend more than two minutes in a given scene. The key Avengers (Iron Man, Thor, Hulk, Capt. America) play to their characters’ strengths, whether viewed solely from their solo movies or from comicdom. Even better, Bruce Banner, played by Mark Ruffalo, is actually a likeable character who avoids the “poor pitiful me” portrayals of past versions, both TV and movie. Whedon’s characteristic wit is on display, and in perfect harmony with the characters. The pokes and prods during the “slow” scenes are the real “punch” of the movie. Special effects are awesome. Ever since the first Spiderman movie, it’s been apparent that movies can adequately convey what kids imagined from still scenes in the comics. CGI changed the game, and ample Transformers type indulgences prevail here. One notable improvement is the best rendition of the Hulk to date. Also, I’d like to watch this again just to pay more attention to which historic buildings, and the details of same, get trashed. Sorry, NYC. Intergalactic war is not a covered peril on your insurance policies. This has the best “boss” scene to date in any of superhero movies, which tend toward silly inevitabilities. The ending fight sequences are deservedly long and fairly intimidating, even if many of the bad guys tend to cling to building walls and set themselves up as bowling pins. That’s a lot of great things, especially considering there is no plot. And how could there be a plot? Even the “origins” movies don’t have plots, per se. Introduce ordinary guy, transition by some means to gain special powers, and toss in a morality factor to keep the character human, all the while developing a super villain in some form for a final showdown. Don’t blame them for not having plots... it’s just the way it has to be. 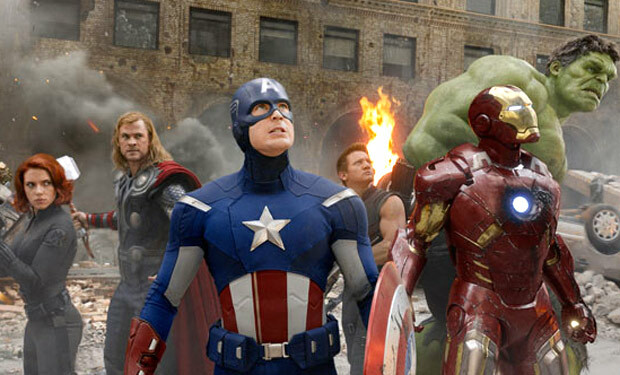 The Avengers’ storyline, then, is also necessarily 1-2-3. Introduce a threat of mass destruction that would call for more than one superhero, follow the trails to wherever our Avengers are lying about, fashion them into a team, and beat the bad guy(s). Whedon got the characters and dialogue right, and 2 hours 23 minutes should allow that. The real test will be Avengers 2, when much more creativity will be needed to to fill the space between the bad guy’s introduction and his ultimate subdual. I’d guess we’ll add an Avenger or two to fill some space. There’s also a problem with the lesser Avengers. Black Widow, who had a minor role in Iron Man 2, is unnecessary. Attractive? Yes. Necessary? No. Hawkeye, who appeared for a few seconds in Thor, is basically wasted as we never really come to know the character. Sure, the extra two bodies help against an invading horde, but there’s not much to them. (Humorous Hawkeye observations HERE, poor form obvious even to me during the movie). And that brings me to football. Yes, football. Captain America might be a minor Avenger. Symbolic, sure. Straight arrow, no non-sense, leadership virtues... it’s probably good to have someone like that on a team. Is he the QB? No. Robert Downey (more so than Tony Stark or Iron Man) has that role. Whedon does a fairly clever job of trying to build up the Capt. America brand by pointing towards his legacy from WWII... because his character isn’t relevant beyond a “gifted man on the street” perspective. Otherwise, his claim to greatness is that that he doesn’t get pulverized by more powerful beings. A fine shield you have there, Cap. It’s interesting how screen shots for superhero movies typically involve a heroic pose or an action snapshot beating up on a bad guy. It’s hard to find a picture of the hero taking a similar hit that propels him through multiple walls. Watch Iron Man. Happens all the time. As the lawsuits mount for concussive hits in the NFL, I can’t help but wonder how any hero (aside from Superman) takes the hits that they do. Capt. America would require 30 minutes of healing time after each punch, I would think. Iron Man’s suit.. sure, it protects the flesh, but not the force of a sudden inertial reverse or smashing through steel members. Hulk? Hmm. He doesn’t seem to feel anything. I guess he gets a pass. Thor? Well, the bust out loud scene in the movie was Loki vs. Hulk, and Loki survived. So I guess Thor should get a pass too. Never mind.